io9 recently had the chance to catch up with the one and only Mike Mignola and get the scoop on all things Hellboy. The prolific comic creator told us the secrets of Big Red's wrestling match with Frankenstein's Monster, why he can't watch The Amazing Screw-On Head TV show, and what to expect from 2012's big Hellboy story, wherein our hero goes to Hell. To kick things off, I really enjoyed the recently released graphic novel Hellboy: House of the Living Dead, your follow-up to Hellboy in Mexico (Or A Drunken Blur). Hellboy getting in a lucha libre match with Frankenstein's Monster tends to win me over. When I did the standalone Hellboy in Mexico comic, I was left with the idea that Hellboy was in Mexico for several months after the events of that story, but he just didn't remember it. I just kept thinking, "Man, what a great place to tell stories." Also, you've got the disclaimer that Hellboy doesn't remember these stories. Did it happen? Not happen? Does he have faulty memory? I was originally going to draw this crazy parade of a story myself, but Richard Corben could do it better. I loved how Frankenstein's Monster eventually goes drinking with Hellboy and mutters this throwaway line about how the story's mad scientist bought him at a carnival. When it came to doing the copy for the back cover of the book, it mentions a wrestling match with "The Frankenstein Monster." When we did that back copy, I thought to myself, "Oh, he is The Frankenstein Monster!" I couldn't put "a Frankenstein-like Monster" or a "Corpse-Cobbled-Together Monster." The only way that paragraph was funny was if I put "The Frankenstein Monster." When I did the story, it wasn't intended that he was The Frankenstein Monster, there was just that ambiguous carnival line. But after the cover copy, I started plotting a million story about The Frankenstein Monster. One line, opening up so many doors! House of the Living Dead was a nonstop cavalcade of monsters, like a Santo film. I love the absurd team-ups of those films, but what I grew up with were Universal Studios monster movies, like House of Dracula and House of Frankenstein. I wanted to take that Universal mash-up formula and put it in Mexico. That formula also inspired the Santo films, I'm pretty sure. 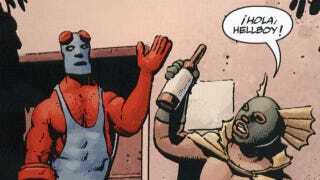 What can you tell us about 2012's big Hellboy story, Hellboy In Hell? What else is there to say? He's in Hell. I have to be careful, but the first four issues are one story that should come out monthly starting August. That establishes a lot of Hellboy's family stuff, certain lingering things that have been dealt with over the years. It's a personal story about him, but with huge ramifications for the structure of Hell. I'm trying to get Hellboy free of the giant, Beast-of-the-Apocalypse storyline. That story has to get bigger before it can be put away. This first arc is the culmination of all the prophecy crap I've been trotting out throughout the years. We put a lot of things to bed. How about the B.P.R.D.? What's cooking with them next year? There's B.P.R.D. Hell on Earth: The Long Death [left], which is probably the most violent series that [writer] John Arcudi's ever done. This is a step up from John's previous miniseries The Killing Ground, which was the most violent one before. Artist James Harren is so perfectly suited for The Long Death, it's just phenomenal. Dark Horse editor Scott Allie and I have also co-written a couple B.P.R.D. stories, one is The Transformation of J.H. O'Donnell. That's a flashback story about Professor O'Donnell and we find out why he's crazy. Scott and I are also doing a B.P.R.D. vampire story Pickens County Horror [left]. I've dropped a lot of hints about vampires in the past few years and we flesh that out here. Everything in B.P.R.D. amps up to an insane level. We're making sweeping changes to the characters and the world, and we get to see what role vampires play. To wrap things up, I just want to express that it's a great travesty The Amazing Screw-On Head was never picked up for TV. Once in a while there is still talk of someone trying to do something. I've never seen the show, never will watch it. Nothing against it, but that was my favorite comic I've done, so it's really hard for me to be objective about something that's changed from the original. But I appreciate that everybody loves it. The animation is based on my style, which makes [the artistic differences] all the more glaring to me. If it was a different art style, I'd probably be able to watch it. It's just that I can't be objective when someone's drawing something that's supposed to look like it was drawn by me. B.P.R.D. Hell on Earth: The Long Death #1 is out February 15, 2012. B.P.R.D. Hell on Earth: The Pickens County Horror is out in March, and B.P.R.D. Hell on Earth­: The Transformation of J. H. O'Donnell hits stores May.